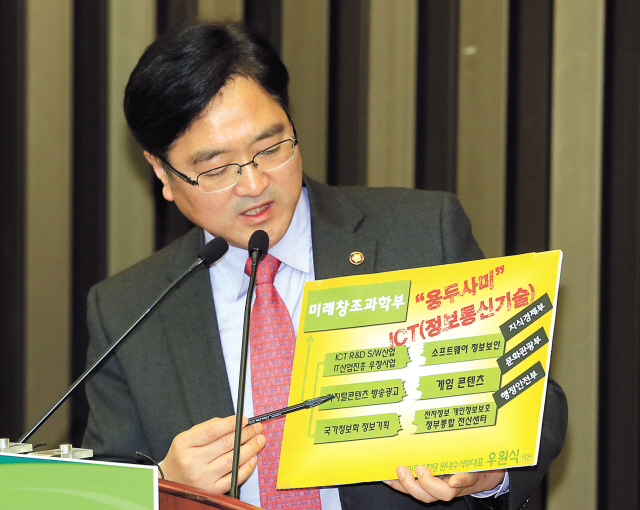 A new powerful ministry dealing with policies on science, information and IT is finding it difficult to set sail due to political wrangling, more than a week after the Park Geun-hye government was inaugurated on Feb. 25. President Park proposed the establishment of the so-called Ministry of Future Planning and Science to embody her vision of a “creative economy.” But the proposal for government reorganization has failed to win approval from the National Assembly in the face of objection by opposition parties to allow the ministry to control broadcasting-related policies. Amid the political deadlock, minister nominee Kim Jeong-hoon withdrew his name Monday, saying that he was unable to “maintain the will to sacrifice” himself for his country. “Some say that the new government branch will have too much power and some others say it’s just being overemphasized, but the main message is that it aims to create new jobs and projects through IT and science,” said Chang Soon-heung, a professor of nuclear quantum engineering at Korea Advanced Institute of Science and Technology. Chang, who is a leading authority in nuclear study, has been a part of Park’s transition team, helping the new president to establish a more creative and technology-driven economy ― drafting measures on developing the software industry and supporting start-up firms while setting up the infrastructure for the new ministry. The launching of the ministry was scheduled for later this month. However, that will most likely have to wait until next month as the new administration will need to pick another candidate for the ministerial position. Led by one minister, the giant ministry would be composed of two vice ministers, four bureaus and seven divisions. It will employ about 800 public officials in the fields of ICT and science technology. “The political wrangling seems to be a waste of time because they should be really brainstorming for better ideas at this point if they are really creating what will be the government branch responsible for next-generation growth engines,” said an industry insider. The withdrawal of nominee Kim has also shocked the related industries, as many believed the former president of Bell Labs was the right fit for Park’s reach for a creative economy. He was one of the rarely heard success stories of a Korean entrepreneur who achieved his American dream, starting with his venture firm Yurie Systems. Government officials said they were briefing him about state policies even just a day before the announcement was made that he was to drop out. In response to the announcement, President Park said in an urgent public statement this week that she feels pity about Kim’s withdrawal, but that she cannot give up on the Future Planning and Science Ministry, which will back up the bigger picture of building a creative economy. “We just hope that the next nominee will be the one to be truly successful in nurturing future growth engines, which is the ultimate goal for this government,” said another industry source.